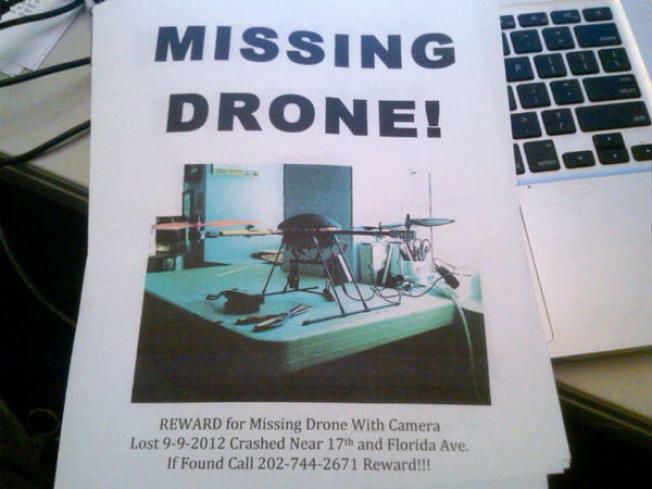 A missing drone crash-landed near Adams Morgan last week. As ominous as that might sound, it was actually a tiny remote-controlled helicopter owned by Adam Eidinger of Mintwood Media. Also the co-founder of the now-shuttered Capitol Hemp, Eidinger was flying his aerial camera equipment "when it was blown out of remote control range and disappeared," CityPaper reports. A huge gust of wind blew it too far south and Eidinger quickly lost orientation. The copter was almost 5,000 feet away from him, and he couldn’t tell which way was forward and which way was backward. When his remote loses contact with the drone, says Eidinger, the copter is programmed to slowly descend on its own -- a "safe landing mode," which prevents it from simply falling out of the sky and crashing. So it’s possible that the quadcopter is sitting on a rooftop somewhere in the area -- maybe even on your rooftop (have you checked?). He's offering a $200 reward for it and the camera. According to the MISSING DRONE! poster, it crashed near 17th Street and Florida Avenue Sept. 9.